London Fashion Week, Krispy Kreme Doughnuts and Glamour! I always love it when London Fashion Week comes around, of course there’s that patriotic feeling when you think of the amazing talent that we seem to create in the UK. Then there’s the mild amusement at some of the rather ‘creative’ hair and makeup combos. Not forgetting the drooling and dreaming over many of the gorgeous clothes that sashay down the runway. All of this I enjoy from the comfort of home in the pages of a magazine (not quite front row caliber unfortunately) with a handful of snacks. So when I found out that Glamour Magazine had collaborated with Krispy Kreme Doughnuts for London Fashion Week to promote a positive association between fashion and food I was both impressed and more importantly… hungry! I’ll admit that I haven’t eaten a Krispy Kreme in quite awhile as unfortunately there isn’t an outlet very close to my home :(. But the last time I did I instantly understood their enduring appeal. They are heaven in a rather sinful mouthful. But up until now I never realised that a doughnut could be anything other than delicious, let alone fashionable! But these special Fashion Week beauties have a fruity glaze that looks just like lip-gloss! The Glamour Glaze collection features a Strawberry Glaze and a brand new Orange Glaze. Even more clever the Orange Glaze was created by predicting upcoming fashion trends. Think the 1970s and bright colour combinations and you will have the two key themes for the upcoming season. Well if that isn’t a recommendation, then I don’t know what is. To get your hands on one (and buy one for me 🙂 ) visit www.krispykreme.co.uk to find your nearest stockist. The new limited edition collection will be available at all Krispy Kreme UK stores and in-store cabinets from the 29th August until 2nd October. 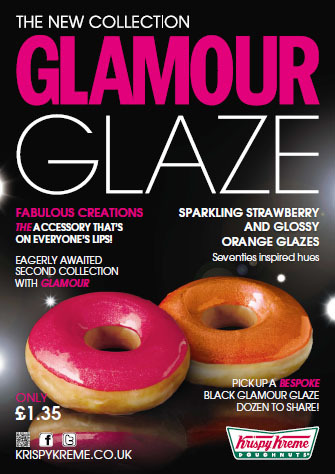 A single GLAMOUR Glaze costs £1.35, or you can have a Dozen Doughnuts packaged in a bespoke black GLAMOUR Glaze box! Comments Off on London Fashion Week, Krispy Kreme Doughnuts and Glamour!